Love Clubcard, don’t collect Avios? You should be reading our sister site, Shopper Points (www.shopperpoints.co.uk), which covers the latest Clubcard and Nectar offers without any distracting frequent flyer talk! Why not check it out now? 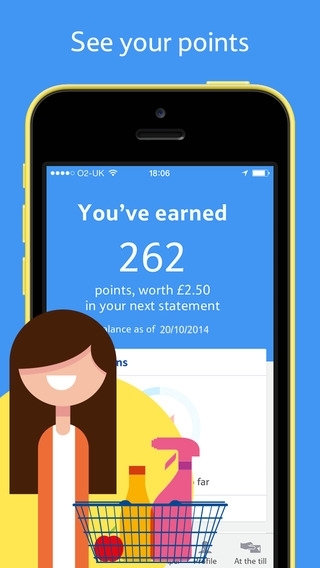 Tesco has launched a new version of the Clubcard app, available now from your local app store. The only reason I mention this is that the app allows you to leave your Clubcard at home. If you click on ‘At the till’ a QR code version of your Tesco Clubcard appears on screen which can be scanned in. It also allows you to check your Clubcard points balance without logging into the Clubcard website. This is handy as the additional security procedures that Tesco has recently introduced have made logging in a cumbersome procedure. There is no statement feature so you cannot see where your points have come from or even what the last movement was – you only see the headline figure. Other features include details of the nearest store depending on where you are and the ability to receive personalised offers on your phone – although none of the ones I received are for extra points, only money off or 2-4-1’s. The latest Clubcard app is not a breakthrough in technology by any means but the ability to use it as a Clubcard does mean there is some incentive to download it. The FAQs in the app day that customers in a Plymouth and Notthern Ireland can use the app to access their coupons – presumably it’s a beta test here before being rolled out nationwide. Does this work at self checkouts? I don’t think they have QR scanners there, but maybe they regular till can carry them. If it worked it would be great as I sometimes forget to take my clubcard with me! Would be nice if they did it as a passbook so it appears on your lock screen when entering the store. I used a site to generate one myself but the scanner at Tesco didn’t recognise it. Mine does not have the QR code for some reason, and hasn’t since the app was updated. Just the sixteen digit clubcard number in text. The cynic in me thinks that’s Tesco trying to stop people leaving their Tesco credit cards at home if that’s what they normally use as a clubcard. Anyone else think they’ve complicated the Clubcard scheme so much now that its impossible to know or remember what the benefits are at any point in time? Mrs Frog bought a whole load of stuff for the tadpole for Uni, only to take it all back when I said she could use Clubcard points worth double online. So, instead of processing the refund and then picking and sending the same stuff out for collection at our local store, why not say “if you use your vouchers, I’ll give you this at the till for half price”? Apparently you can not use this app at a garage, they still require the app with the bar code not the QR code. You could just give them the number off of it but my local Extra have some surly people working there, and they are loath to type in numbers! I don’t take my phone shopping, but I always have my clubcard tag on my key ring. The best thing about this app is I can check my balance from outside the UK – the main website doesn’t let you login unless you have a British IP address (so I have to use a VPN/proxy from abroad). “available now from your local app store.” I cannot find this app anywhere. Can someone post a link? If you’re running anything other than iOS or Android, you’re out of luck. Thanks. Now on holiday outside UK so I guess that’s why nothing showed up, as with the [Android] link I get “no eligible devices for app install”.